Coamo is located in the southern region of Puerto Rico, about 90-minute car ride away from Luis Muñoz Marín International Airport (SJU). Coamo is known as "La Villa Añeja" (old villa) or "La Villa de San Blas de Illescas" (San Blas de Illescas villa) in honor of the San Blas Half Marathon celebrated every year in February. Coamo is the third-oldest town in Puerto Rico, established by Spanish settlers and founded on July 15, 1570 by Cristobal y Blas de Illescas. Coamo was the capital of the south until the 1880's, when political power moved to Ponce. The town original name was San Blas de Illescas, later changed to Coamo, named after a local Indian chief Coamex or Coamey. By 1582, there were twenty families living in Coamo, in the same area where the Tainos had had their village of Guayama. Coamo became officially a town in 1616, and given the title of "Villa" by Spanish Royal Decree in 1778. Coamo is famous for its thermal springs, the Coamo Thermal Baths. Long before the Europeans arrived, Indians bathed in a thermal spring at Coamo; according to one legend, this was the fountain of youth the Indians described to Ponce de León. Today, a parador -Los Baños de Coamo- surrounds the famous spring. It was considered the islands most fashionable resort from 1847 to 1958. 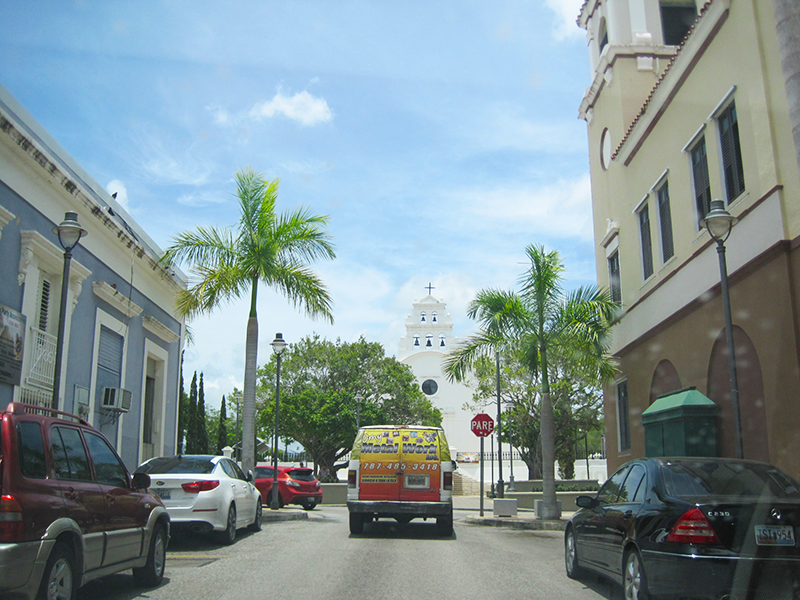 Highlights of the town's include the historical 18th-century Church of San Blas de Illescas located on the center plaza, considered one of the most important works of religious architecture in Puerto Rico. Open daily, 6:30am-12:00pm. Be sure to explore nearby buildings and sites like the City Hall, Efren Bernier residence (Casa Blanca), and Jose Ignacio Quinton residence. Coamo is also home of Museo Historico de Coamo, an elegant masonry home converted into a museum with turn-of-the-century furnishings and local history displays. Open daily, 8:00am-noon 1:00pm-4:00pm, (787) 825-1150 Ext. 206. Another attraction in Coamo is the Coamo Springs Golf and Tennis Club, located in Barrio Las Flores. Open Mon-Sun, 7:30am - 3:30pm, (787) 758-1212. Every year in February Coamo hosts the San Blás de Illescas Marathon, inaugurated in 1963 by Phi Delta Fraternity in honor to the founder of the town. International and local runners compete in a 13.1-mile half marathon. It's Puerto Rico's biggest race, and the crowds are always large. If you are looking for a place to stay during your next trip, Baños de Coamo offers air-conditioned rooms with a pleasing blend of contemporary and period furnishings. Located on Route 546, Km 1, (787) 825-2186. The town is a trading center for machinery, aircraft radio components, machines, and clothing. The surrounding areas produces corn, mangos, oranges and plantains. Coamo was the very first city to produce coffee. First school building was constructed, the Benjamin Franklin Middle School. Maria Teresa Babin - college professor, writer, and founder of the Puerto Rican Studies Department at Lehman College in Nueva York. Every year, Coamo celebrates a patron saint festival. The festivities include dances, food, parades and religious processions. Every year in february Coamo celebrates San Blás de Illescas Marathon, inaugurated in 1963 by Phi Delta Fraternity in honor to the founder of the town. International and local runners compete in a 13.1-mille half marathon. It's Puerto Rico's biggest race, and the crowds are always large. Coamo, Cuyón, Descalabrado, Lapa, Jueyes and Mina. Annual precipitation is approximately 78 inches and the average temperature is 78 F. August is the warmest month of the year. January is the coldest month. There are 21 public schools in Coamo, education is handled by the Puerto Rico Department of Education. Both the flag and coat of arms were adopted on August 5, 1969. The flag design consists of three equal horizontal stripes. The red, yellow, and black colors are derived from the municipal coat of arms. The red represents martyrs and refers to the fact that Saint Blas was decapitated. The gold yellow alludes to the excellent qualities of San Blas and the parched plains of Coamo. The black refers to the sorrows and tribulations endured by Coamo. The flat should fly with the black stripe down. The coat of arms is divided into four parts and characterized by the colors: red, black, yellow and white. The bells represent the three city's Catholic churches, Altagracia, Valvanera and San Blas. The bishops' hats represent the bishops that founded the city: Mercado and Salamanca. The flames represents the city's patron, Our Lady of the Fire. The crosses represent the cross of the Villa, property of Cristobal de Illescas. The horse and bull represent the cattle industry. The gold color that serves as background recalls the yellowish reddish tone of the fields of Coamo during the droughts. The circle whit blue lines represent the Thermal Baths of Coamo.